I’m convinced that the people who actually write for magazines, edit them and publish them have never actually tried using their iPad versions for more than a few moments. If they actually did try to use their publication’s app as the actual means to read each issue, things would have to improve. Right? RIGHT?! Magazine issues should download in the background, so that you can get on and read the magazine (or work with another app) whilst the full content is sync-ing. The downloading/syncing system should allow you to download multiple issues at one time (without having to go back to the list to choose another issue for syncing). If the magazine is in iTunes Newsstand the current issue should download even whilst the iPad/iPhone is not in use. It should be easy and obvious how you download a set of issues and it should be equally obvious how you delete back issues that you no longer need to have sync-ed to your device. Exact Editions has one other important aspect of ‘issue management’ covered. It is really easy to search across the back issues included in a subscription. An individual issue can be searched on its own, (a simple requirement which is not in fact possible with many magazine apps now being sold through iTunes newsstand), but it is also practical and easy to search the complete archive. If the subscriber pulls up the issue list they simply type the search term (or terms, Boolean/Google search logic is supported) into the search box and a scrollable results list pops up. Obviously an internet link is necessary for archival search to work, because the app will be searching issues that may never have been synced to the device. Also with a web link the user can immediately jump to the page listed (in red) in the relevant magazine issue. Justin Williams does not consider the necessity for ‘search’ in his review of the logistics of issue procurement, but I think its a crucial requirement for magazine apps that work across a collection of back issues. Procurement is not just a matter of getting hold of the latest issue, if you live with a magazine subscription reading it regularly you will want to return to stuff that you have noticed before…. 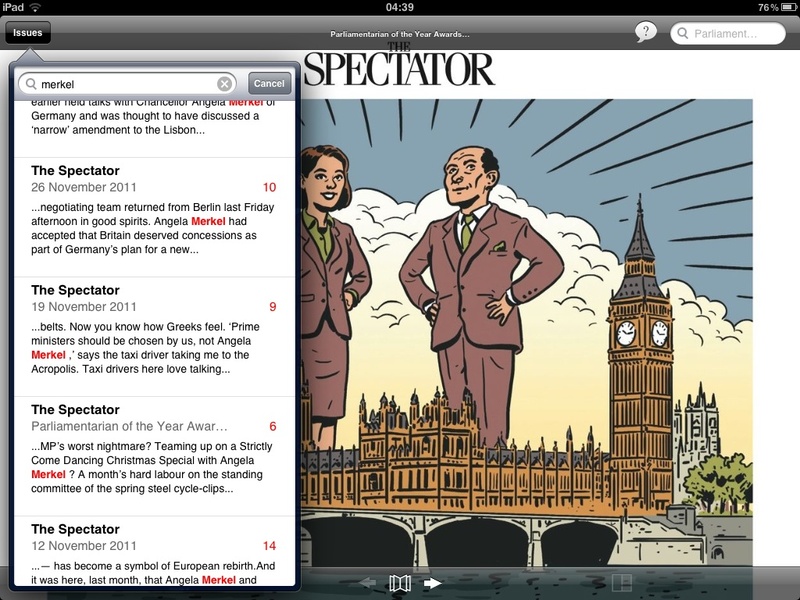 “Now where was the article about Merkel and Barroso in the Spectator? Did I read it this year or last?” In general the back issues accessible to a subscriber from a magazine app will only be useful if its possible to search the archive. It is surprising that more thought has not been given to this obvious requirement for in-app searching by magazine publishers and app developers. Digital magazines become more valuable to their subscribers when the archive is available, when the back issues are as easy to access as they should be. But access necessitates searchability. In fact we might question the value of having back issues accessible to an app if they are not searchable. All Exact Editions magazine apps are searchable by issue and across back issues, is it possible that we are the only platform for magazine apps which currently provides this?